As part of our research for the project, we conducted an anarchaeology of the city and its people and created a series of Impressions to inspire different perspectives on the key themes for workshop participants and project stakeholders. The Impressions, initially created as a means of conveying a local sense of place to national and international participants, were inspired by the series of ‘Wanderings’ that Proboscis undertook with local people in Peterborough as a means of conveying a local sense of place. and concerns. They are about what could be seeded, nurtured and grown and what seeds exist here already to help everyone do that. The wanderings involved conversations and encounters with over 20 local people of different ages and backgrounds. Proboscis journeyed through townships, villages and city by taxi, train, bus, bike, kayak and on foot to investigate and explore the city and its surrounding landscapes. 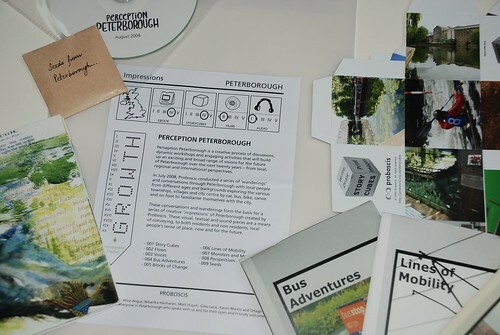 We gained a richer understanding, through local and grassroots perspectives, of people’s perspectives of what it is like to live in Peterborough and their aspirations for the future. The resulting series of Impressions include short films, audio collage, eBooks, StoryCubes and drawings that can be shared physically and digitally and combined with existing policy material to add new perspective to the visioning process. Briefing Pack StoryCubes (illustrated by Matt Huynh).